These gloves are consistent with the major brands we’ve carried—Tour Master, Joe Rocket, Olympia, etc, so hopefully you’ve had some experience with buying gloves and can choose based upon the fit of a previous pair. If you have no previous experience with glove sizing, go here for help. The Ace leather gloves by Roland Sands offers more protection than their other street rider gloves. They come in colors that will compliment non-race style jackets (many jacket styles from RSD) so that makes these gloves unique among our selection of longer cuff gloves. The longer cuff will give you extra abrasion protection in case of a fall. The leather will give protection, but there is also an additional padded protector on the outside of the wrist. The retro styled ribbed area on the top of the gauntlet is also lightly padded. Elasticated leather over the knuckles makes these gloves easy to flex and the thickness of that ribbing will give a bit more impact protection than plain leather. Also there are a couple dense padded areas in the heel of the hand and some small strips of padding on the backs of the fingers. 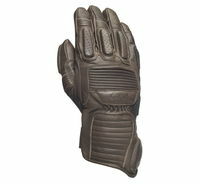 This is not a heavy weight glove so they should be reasonably comfortable in all but very hot or very cold conditions. The leather is soft and of higher quality so I wouldn’t expect a difficult break in. They should be quite comfortable and good looking after some use. :: Paul, 03-19-18. Roland Sands says: Featuring an asymmetrical protective cuff, the Ace is made of top-grain cowhide and features padded backs of hands, wrists, palms and knuckles.